The next time I doubt the depth of my gardening devotion, remind me that one of the very best Mother’s Days I ever had was spending the entire afternoon pulling garlic mustard out of the Secret Garden with my younger sons. In case you aren’t familiar with it, garlic mustard is a very invasive plant that crowds out a lot of native spring ephemerals. I don’t believe it grew on the property when we moved here over 16 years ago, and then suddenly it was everywhere. Knowing the seeds persist in the soil for at least 5 years, I looked at the growing patches with increasing dismay. I finally came to my senses and realized that if I had help, it could probably all be pulled in a day–this year. Next year it would only be worse, so now was the time to start. And what better day to ask for help than Mother’s Day. It was perfect weather for pulling weeds. The soil was moist, the air cool but not chilly, the sky cloudy but not threatening rain, no bugs–and someone else was cooking dinner! We pulled and pulled and pulled, and bagged what we pulled, because I was afraid that garlic mustard could go to seed even after being pulled. 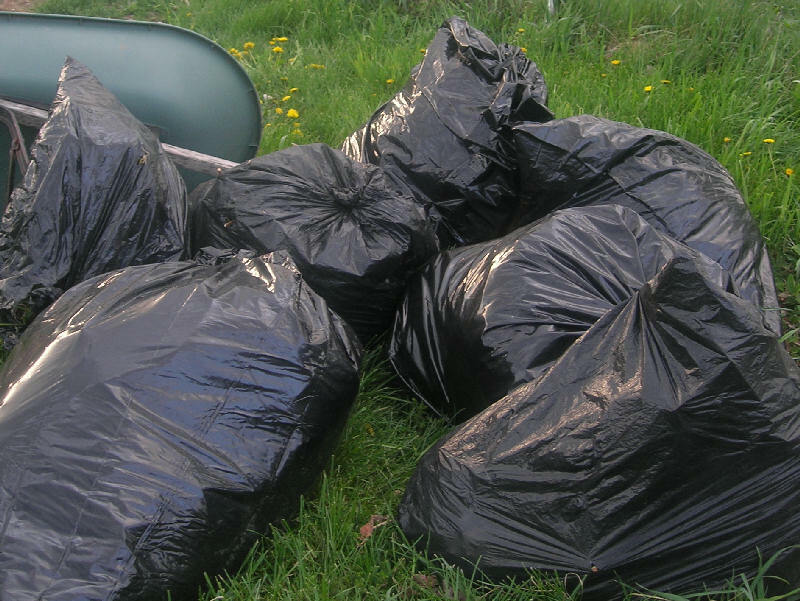 I plan on letting the plants bake in the dark plastic bags, and when I’m sure it’s rotted without having seeded, only then will I add it to the compost pile, if I ever do. I might toss it all on burn pile instead. Four more years of pulling . . . I think I’ve just started a new family tradition for Mother’s Day. Happy Mothers day, coming up! I wonder whether you’ve got your Garlic Mustard eradicated yet? If you haven’t here are two recipes we just made up and enjoyed! It’s just the right time to pick it – snap the tops off to use in these delicious recipes, and then pull the rest out by the roots so it won’t grow back and set seed! Boil instant brown rice for a few minutes until half done, in a volume of water a little less than half of the volume of food you desire for the meal. Regular rice may be used, but you should cook it for twenty minutes before the next step. Add a cup or two of pureed tomato or pasta sauce. Continue heating. Add garlic, freshly minced or pressed, or as flakes. I used some dried bell pepper and garlic I found in our friend’s cupboard. After the pot is resuming a good boil, open a can of smoked herring (the round tin of Latvian herring, from the imports aisle at Food Basics, or some other kind of smoked meat if you don’t like fish) and dump it in, oil and all, breaking the fishes into pieces with the stirring spoon. Taste, and if it needs more salt, use any kind you like (you could use soy sauce, but my favorite is Umeboshi Vinegar) to taste. Turn the heat down and simmer slowly for 10 or 15 minutes, or turn the whole thing into a casserole dish, grate cheese over it, and keep hot in the oven for about half an hour. This combination is synergy exemplified! The bitter herbs, the smoky oily fish, and the acid-sweet tomato are fabulous together, and the rice and texture of the greens together are succulently munchable! A wholesome, balanced meal – there won’t be any left in the pot! 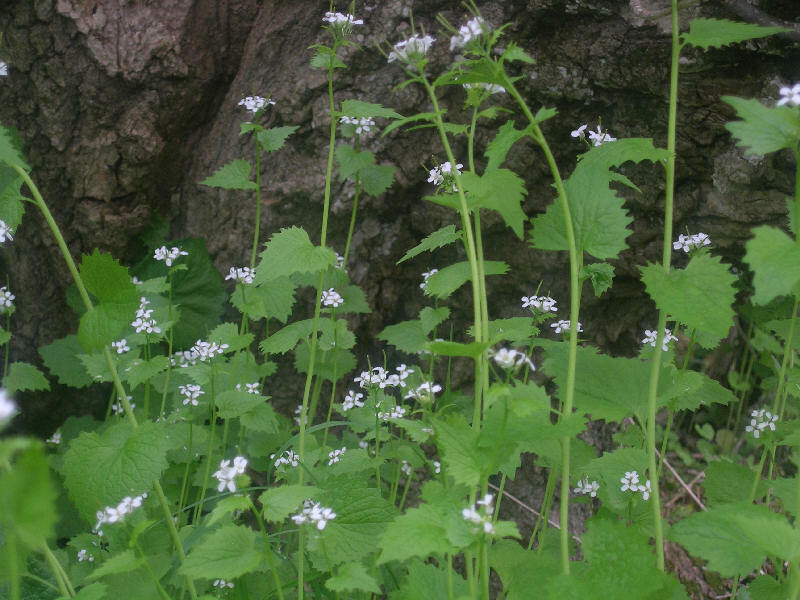 Take a moderate handful of spring Garlic Mustard (shoots or in flower, include the flowers, and the lower leaves, if you want to trim off some of the tougher stem. Chop it into a couple of inches of boiling water and cook until just when it begins to lose its bright green colour. Drain off the liquid and dump the greens into the bowl of quinoa. Add a tablespoon of olive oil – or make it toasted sesame oil if your fish are not smoky flavored. Optional: one large spoonful of mayonnaise (I prefer the olive oil kind) – especially useful if you didn’t have any East Indian cooking sauce. A different option would be half an avocado, diced fairly finely and mixed in. You can chill this mixture and serve later, or serve while still warm from the addition of the hot greens. Just before serving, grate a hen’s egg sized piece of sharp cheddar cheese into the bowl and mix thoroughly, then serve. This salad has a wonderful texture and a flavour both wholesome and snappy! Can it be composted safely without making the compost toxic? It’s just the seeds you have to worry about. If you don’t kill them, you will have garlic mustard everywhere you spread compost. I learned that somewhere along the line. Just haven’t bothered to try yet. Just think, if it became my family’s favorite vegetable, we might eat it to extinction! I have a kind of mustard that has sulfuric yellow flowers. I bought it from a garden center, where it nestled among other vegetable and herb starts. It self sows. Very prolific! I’ve wondered for years what this weed was called. It likes moist spots at the edges of woods. 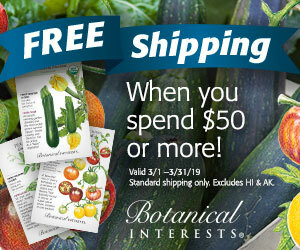 The really dastardly thing about it is that it sets seed so early in the season–right when you’re just getting to work on your vegetable garden or mulching your flower-beds and don’t want to be interrupted by any weeding jobs. Update: today we went to see the last steam locomotive made for Union Pacific, built in 1944. The train was passing through Austin from San Antonio and had stopped so that RR fans and families with kids could see it up close. As we walked away from the station along the tracks, I noticed a huge stand of garlic mustard! First time I ran into it here. You will only make your infestation worse. It spreads primarily by underground rhizomes, and they are stimulated to grow faster and farther by having the aboveground part of the plant pulled. I’m a Goutweed war veteran, and I have to tell you that you cannot dig it up successfully, either, because it will regrow from a small fragment of rhizome left in the soil, and they break easily. Sorry to say, Round-Up is literally the only recourse. Anything else you do will only make it worse. If the goutweed patch is still confined, you could try covering it and a 2-foot margin on all sides with several layers of black plastic for a couple of years. Sometimes that works. Ok. But you could do triage on the writing tasks, same as on the weeding, as I saw in your article in the new issue of a href=”http://www.hortmag.com/” title=”Horticulture magazine website”>Horticulture magazine — nice piece, by the way! It’s what reminded me to return to your website! In other words, you need not wait til you have the perfect essay, but just drop us a few lines now and then….. I would like to write about it. It is on my list of things to write about. But I think it will be an essay and not a blog post. And it will have to be when there’s less weeding to do. 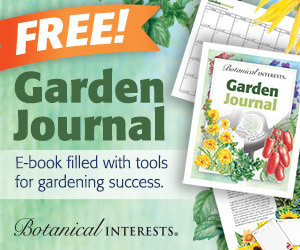 Have your written about your ‘Secret Garden’ ? I would like to read about it! I have this garlic mustard too. I have sort of corraled it. That is the best I can do. The other one that has taken off on me is Queen Anne’s Lace. I have one garden where that one reigns. It is my own fault for liking the flower and inviting it in the garden. What was I thinking? Your Mother’s Day weather sounds wonderful! This one brought back memories of the never-ending battle against garlic mustard! I also used the bag/wilt technique in Illinois, but we have different invasives to pull here in Austin. When still living in Illinois we read that it had been brought to the USA as one of the traditional ingredients for spring tonics, and also that the closer you lived to the railroad tracks the heavier your infestation. It sounds like you had a great Mothers’ Day! Blooming now – Parrot tulips, which I love. Honesty, which I love. Globe flowers – I need more of these. Peonies and bearded irises, very close. Currently delighting in the incredible smell of a village filled with blooming lilacs. How funny! I just pulled this plant. I let it go thinking it was some lost perennial – it seemed so plant like. I was going to mail you some for identification, but I decided today it was a weed and yanked it. I, too, spent Mother’s Day moving plants, weeding, mulching, and sowing the last of the seeds. Very rewarding!